The best thing about PlayStation Plus is the Instant Games Collection, a feature that offers up free, top-shelf titles to the online service's paying members. PS3 owners have been enjoying those perks for a while and now they're coming to Sony's gaming handheld. 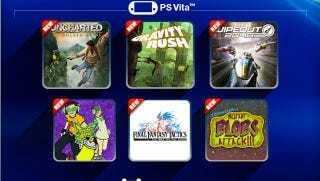 Next week, six free games—including Gravity Rush, Jet Set Radio and Final Fantasy Tactics: War of the Lions—will be coming to the Vita when PlayStation Plus support comes to the handheld. If you're already a PlayStation Plus member via your PS3, there's no additional cost to the $50/year fee to access the service on Vita. PlayStation Plus on Vita goes live next week with the 2.0 system update.